Lt. 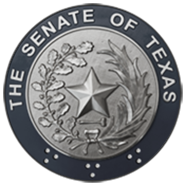 Governor Dan Patrick was joined by members of the Senate to call for extending funding for Texas National Guard troops on the international border with Mexico. (AUSTIN) — Texas must continue to secure its international border with National Guard troops past a March deadline, Lt. 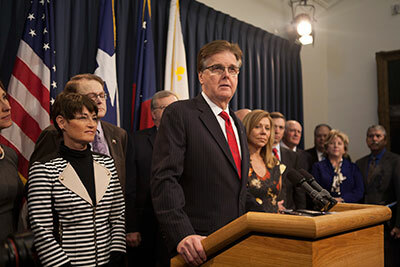 Governor Dan Patrick told reporters at a press conference Tuesday. With funding due to run out next month, Patrick said the state must continue to pay for Guard forces to stay on the Mexico border through at least August. "Now is not the time to remove the National Guard from the border," he said. In June of 2014, then-Governor Rick Perry announced a "border surge", with increased Department of Public Safety patrols along the Texas-Mexico border in order to curtail illegal immigration and drug trafficking. In July, one thousand Texas National Guard Troops were dispatched to the Rio Grande Valley. That number was reduced to 200 by the beginning of 2015. Patrick said that Guard forces acting in conjunction with DPS troopers were effective in limiting illegal border crossings. According to DPS figures, the number of individuals apprehended while attempting to cross the border illegally has dropped from 6,606 in the first week of the border surge to an average of 2000 per week. "The word got out that Texas was serious about securing our border," said Patrick. Last November, Perry announced that he would fund Guard border operations through March, which Patrick said Tuesday was not long enough. "I did not have a say in that decision nor did Governor Abbot," said Patrick. "But I was very clear at the time that I did not support removing the Guard in March." He said that he wants funding for the National Guard to continue to man the border to help prevent migrants from illegally crossing through the end of this fiscal year, which ends August 31. "[That] would allow the Legislature to make the decisions on keeping the guard there longer," he said. The cost to the state to keep funding Guard operations on the border through May would be $12 million, money which Patrick says is available for that purpose. Funds to keep the Guard on the border through the summer would come from the Governor's office in the form of a supplemental budget, said Patrick. Patrick has made border security one of his top priorities for the session. He said he worked with Senate Finance Committee Chair Jane Nelson to ensure a Senate budget that funds Guard border operations for the next two years, along with more money for DPS border security efforts than ever before. Patrick said Tuesday that the Senate is committed to passing a comprehensive border security plan this session, one that includes increasing the DPS presence along the border. Until then, Guard troops must continue to ensure border security. "The short and long range plan is to keep the Guard there now, as long as necessary, in whatever strength in terms of troop level is necessary until we have more DPS officers stationed in that area," he said. The Senate will reconvene Wednesday, February 11 at 11 a.m.